One film at a time, one shift a day, he decided for creative integrity. He is the highest paid star in hindi cinema. The flip side is that he won't reduce his price for anyone. Despite his bulging pay packet and superstar status the tag we put on him is Actor. 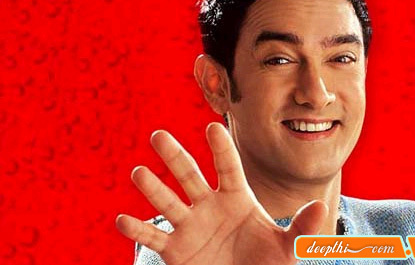 Aamir Hussain Khan, the PET-SHOP boy of the bollywood, was born on 14th March 1965 to Tahir and Zeena Hussain Khan. He is having one younger brother Faizal who is a VJ and an Actor and two sisters Nikhat and Farhad. He was married to Reena Dutt and having two children son Junaid and daughter Aira. But in 2002 he was legally separated with his wife. Aamir Khan, is known as AK everywhere, although his first movie was Holi, but his debut film as a Hero Qayamat Se Qayamat Tak turned out to be a blockbuster of 1988 and set a new trend in cinema. In 1996, he has got the Best Actor award for his outstanding performance in Raja Hindustani which was a smash hit at the box office and he has placed himself among the top heroes of the Bollywood. Sarfarosh and Dil Chahat Hai were again the blockbuster films. He has got the best actor award for Dil Chahata Hai. This movie created a new trend of hairstyle and beard for youngster. He set trends with every film, including his last film Lagaan His next release will be The Rising in which his character name is Mangal Pandey. Rang De Basanti ( Aamir Khan, Madhavan, Soha Ali Khan, Kunal Kapoor, Siddartha), The Rising ( Aamir Khan, Toby Stephens, Amisha Patel, Rani Mukherjee, Coral Beed), Dil Chahta Hai ( Aamir Khan, Saif Ali Khan, Akshaye Khanna, Preity Zinta, Dimple Kapadia, Sonali Kulkarni), Lagaan ( Aamir Khan, Gracy Singh, Rachel Shelley), Rangeela ( Urmila Matondkar, Aamir Khan, Jackie Shroff), Dil ( Aamir Khan, Madhuri Dixit, Anupam Kher), Qayamat Se Qayamat Tak ( Aamir Khan, Juhi Chawla), Raja Hindustani ( Aamir Khan, Karisma Kapoor), Mann ( Aamir Khan, Manisha Koirala, Sharmila Tagore, Deepti Bhatnagar), 1947: Earth ( Aamir Khan, Nandita Das, Rahul Khanna, Maia Sethna, Kitu Gidwani, Gulshan Grover), Mela ( Aamir Khan, Faisal Khan, Twinkle Khanna), Sarfarosh ( Aamir Khan, Naseeruddin Shah, Sonali Bendre, Mukesh Rishi).